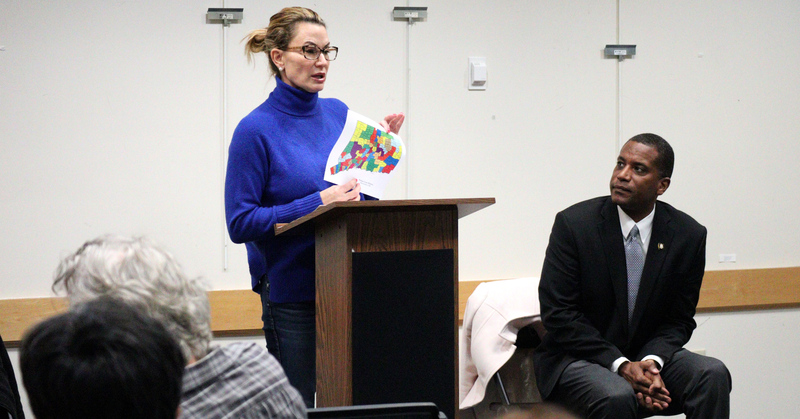 WOODBRIDGE – Over fifty residents packed into the Woodbridge Library on Wednesday night to hear from State Representative Themis Klarides and Senator George Logan about the 2019 legislative session. Many residents in attendance were there to express their deep concerns with a Democrat proposal to force schools to regionalize. The bill, S.B. 454, introduced by Senator Martin Looney the highest ranking Democrat in the State Senate, would force schools to regionalize based on the current Probate Judge map. Sen. Looney’s plan would force Woodbridge to combine with Ansonia, Derby, and Seymour, and Orange would merge with Milford. Rep. Klarides and Sen. Logan told the residents in attendance that forcing schools to regionalize is not the answer. On Thursday morning, Senator Looney said in a New Haven Register Article that the bill was a “misdraft” and that the bill “would not break up the regional school district, and would, in fact, consolidate all of the three towns’ schools into one regional district. In addition, area residents panned proposals to legalize marijuana and increase the minimum wage. A longtime educator said legalizing marijuana would create more issues with drug problems and vaping in schools. And a resident that hires a lot of high school kids in the summer said increasing the minimum wage to $15 would prevent her to hire more kids. Residents are encouraged to contact Rep. Klarides at Themis.Klarides@housegop.ct.gov and Sen. Logan at George.Logan@cga.ct.gov.